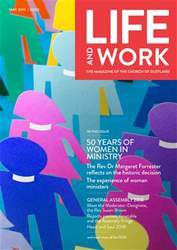 The Rev Dr Margaret Forrester reflects on the journey which led to the ordination of women to the ministry of Word and Sacrament within the Church of Scotland. I first had that conversation within the family when I was eight years old. It happened again when I was choosing subjects for Highers. Nurtured through Scripture Union at school, and at church by Bible Class, Youth Fellowship and Sunday worship, I began to grow in faith and Bible knowledge. Then I met two women who were to influence me greatly.